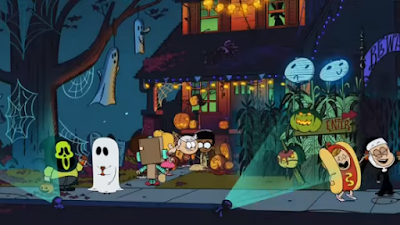 Nickelodeon Italy (Italia) will be serving fans a treat this Halloween with the brand-new The Loud House Halloween special, "Tricked! ", premiering Tuesday 31st October 2017 at 19:30! In the brand-new The Loud House (A casa dei Loud) Halloween special "Tricked! ", for Halloween, Lincoln and Clyde have scoped out a fancy neighborhood to make their dreams of scoring full-size candy bars a reality! Meanwhile, Lucy is putting on a haunted maze and the younger girls scheme to get maximum candy! Viewers can visit the A casa dei Loud page on NickTV.it to watch a exclusive sneak-peek from the special. More Nick: Nickelodeon Italy To Premiere 'SpongeBob SquarePants: The Legend Of Boo-Kini Bottom' On Tuesday 31st October 2017! Follow NickALive! on Twitter, Tumblr, Google+, via RSS, on Instagram, and/or Facebook for the latest Halloween on Nickelodeon Italy and The Loud House News and Highlights!